Haiti and the Turks and Caicos islands have been preparing for the arrival of Hurricane Irma, which has left a trail of destruction across the Caribbean. Poverty-stricken Haiti is seen as particularly vulnerable as its infrastructure has yet to recover from a devastating earthquake in 2010. 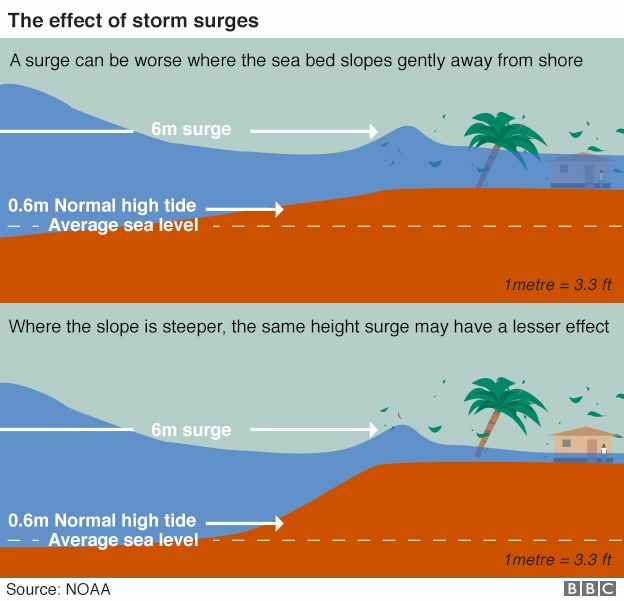 Low-lying Turks and Caicos is said to be at risk of a storm surge, with the possibility of destructive waves up to 6m (20ft) higher than usual. Irma is a category five hurricane. This is the highest possible level for a hurricane, and its winds are travelling at up to 185mph (290km/h). At least 10 people have already died in the region. The small island of Barbuda is said to be “barely habitable”. Officials warn that St Martin is almost destroyed, and the death toll is likely to rise. Irma has passed the Dominican Republic and is now brushing Haiti. It is expected to hit the the Turks and Caicos on Thursday evening. It is predicted to reach Cuba next, before hitting the US state of Florida at the weekend, with the head of the US emergency agency predicting a “truly devastating” impact. An estimated 1.2 million people have been affected by Irma and that could rise sharply to 26 million, the Red Cross says. “Our worst fears have played out in Barbuda and elsewhere,” Walter Cotte, Americas director for the International Federation of Red Cross and Red Crescent Societies, said in a statement. There are concerns that disease could spread rapidly in areas where drinking water and sanitation services have broken down. The storm caused some damage to building and flooding as it approached Haiti, with rain and wind lashing the northern port city of Cap-Haitien. “We’re asking all those living in areas at risk to leave their homes. If you don’t, you’ll be evacuated by force,” President Jovenel Moise said. Preparations for the arrival of Irma are carrying on in the Turks and Caicos, which has a population of about 35,000. Its highest point is only 50m (163ft). Governor John Freeman said: “We have decided to evacuate certain islands which were particularly low-lying and at threat. We have started to fill our shelters because a number of people who live in very low-lying areas are very vulnerable. Virginia Clerveaux, director of the Turks and Caicos Department of Disaster Management and Emergencies, told the BBC that even inland areas could be inundated by the storm surge. “We are now trying to remind them [the people of the islands] that this is a category five, and in the history of the Turks and Caicos islands this is the largest storm we have ever been impacted or threatened by. Britain, France, and the Netherlands have sent ships, rescue teams and emergency supplies to their territories that have been hit by Hurricane Irma. Which are the worst-hit areas? Hurricane Irma first struck the dual-island nation of Antigua and Barbuda. 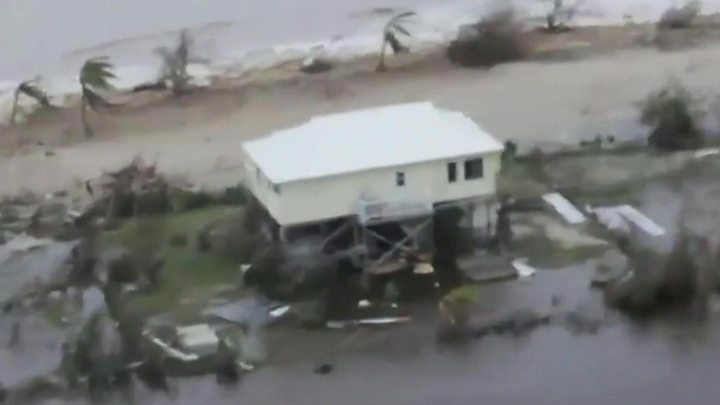 At least one death, of a child, was reported on Barbuda, where Prime Minister Gaston Browne said about 95% of the buildings had suffered some damage. He told the BBC that 50% of the Barbuda population were now homeless and that it would cost $100m (£80m) to rebuild the island. However, Antigua, with a population of 80,000, escaped major damage, with no loss of life. St Martin, an island that comprises the French territory of Saint-Martin and the Dutch section Sint-Maarten, suffered terrible damage. French officials have confirmed at least four deaths in Saint-Martin, down from an earlier reported death toll of eight. More than 50 people were injured. Dutch authorities reported one death and many injuries. French Prime Minister Edouard Philippe said 60% of homes had been made uninhabitable. Sint-Maarten’s airport, the third largest in the Caribbean, has been seriously damaged. At least three people had died in Puerto Rico, the governor’s office said. The US territory’s capital, San Juan, saw waves of up to 30ft. More than 6,000 residents are in shelters, and many more are without power. Where else has been hit? British overseas territories Anguilla and the British Virgin Islands were also caught in the extreme weather. At least one death has been reported on Anguilla, a local official confirmed. One Anguilla resident told the BBC the island looked as if it had been struck by a nuclear bomb, with roofs torn off many of the main buildings, including the hospital. Irma is expected to hit Florida as a category four hurricane on Sunday, bringing storm surges and flooding. US President Donald Trump said: “I can say this: Florida is as well prepared as you can be for something like this. Now it’s just a question of what happens. “We have tremendous talent and really tremendously brave people to be there and hopefully it’s going to work out all right. Evacuations of tourists and residents of the Florida Keys, a resort archipelago, have begun. Flights to and from airports in Florida are being suspended. Orlando’s international airport said commercial flights would stop from 17:00 local time on Saturday.